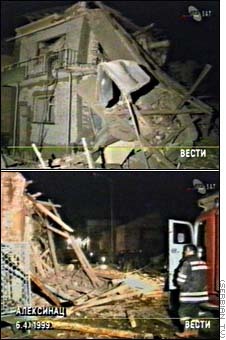 ALEKSINAC, Yugoslavia (CNN) -- It was a night of unrelenting bombardment in the Serbian town of Aleksinac. It was a night that Serbs felt suffering and pain, anger and bewilderment. Two blasts early Tuesday ripped through apartment blocks and apparent civilian homes in Aleksinac as NATO missiles pounded targets in Serbia. At least four civilians were killed, 30 were injured and a medical clinic used by civilians was hit in the town, about 100 miles south of Belgrade. It appeared to be the largest civilian casualty toll since the beginning of NATO airstrikes..
"This is completely inhuman. I can't describe it," a teacher said. "I saved my children and I can only hope we'll be OK."
The point of detonation was sandwiched between a block of apartments on one side and the clinic on the other. Confusion and panic was reported as explosions hit and fires broke out. Windows and corridors were strewn with shattered glass and splintered wood. People wandered around in shock. Survivors said they scrambled through debris. 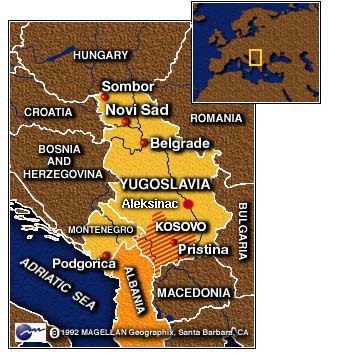 Firefighters doused the flames of Serbian homes. The direct hits caused almost unrecognizable ruin. The citizens of Aleksinac asked why the bombing occurred. "There is a military barracks about half a mile away, maybe more," one man said. "But why hit us?